The author has collected and synthesised information from all available sources and presents this in a logical, understandable and practical manner. He takes you through the decision to go skiing and what it involves. On reaching the slopes he considers the essentials of standing, shuffling, schussing, stopping, steering, sliding and, above all, surviving this unnatural exercise. The text concentrates on foot movements, and the figures are unique in illustrating the position of the reader’s feet. This emphasises the key role ones feet play in controlling the skis in each manoeuvre. The book is a must for all beginners, while those who have had disappointing and painful experiences will find something to empathise with. Even the more experienced will be made to think about each aspect of their technique, and may even find an unexpected solution to one or more of their problems. 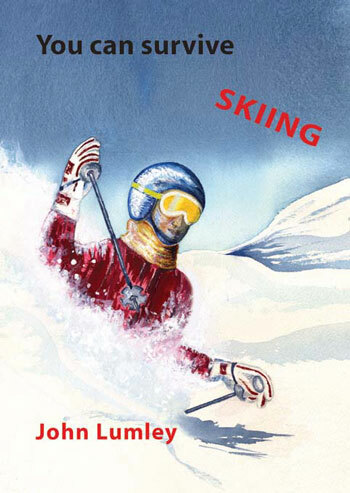 John Lumley, although a very experienced author and editor, is a self-confessed ski failure. However, he considers this to be his greatest attribute when writing You can survive skiing, for beginners and others of equal limitation (living in London didn’t deter him from co-editing a classic text book of tropical surgery either!). As he points out in the preface, when others heard of his mission, after their initial disbelief, incredulity and horror, they all wanted to contribute, confirming his theory that everyone who has been on the slopes (and many who haven’t) consider themselves experts.